You have come to the right place for holiday cottages in the UK. Most of the cottages listed here will allow short-breaks and weekend breaks. Some cottages are adapted for use by disabled holiday makers. You can choose to Look for holiday cottages by county. Are you and your partner looking for a romantic break? if so, take a look at some of these holiday cottages ideal for a romantic break, you may well find your perfect romantic getaway! Fancy a swim to start your day? Do you like to relax in the pool; choose a holiday cottage with an indoor swimming pool - it's a perfect way to start the day. And if you've got children with you, a swimming pool always goes down well. A-B, C-D, E-F, G-H, I-J, K-L, M-N, O-P, Q-R, S-T, U-V, W-X or Y-Z (and cottages starting with a number). Should you fancy a little extra luxury on your holiday, have a look at some cottages and lodges which feature their own hot tub; a hot tub can make the perfect way of relaxing into your holiday - just imagine laying there watching the sun go down after another fantastic day! 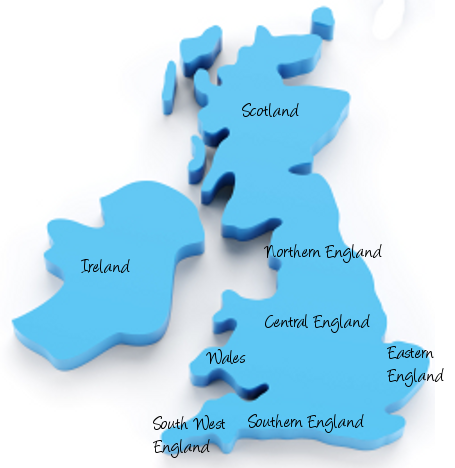 You can find hot tubs in any of these areas: Eastern England, Southern England, South West England, Central England, Northern England, Scotland, Wales and Ireland. Or just click of the map to the right for hot tubs holidays in that area. We feature holiday cottage from a variety of cottage holiday providers, including Hoseasons Holidays, Cottages 4 You, Dales Holiday Cottages and Cumbrian Cottages. Have a look at the cottages featured by these quality providers, and you're sure to find something which takes your fancy. Choose a cottage from Cottages for you. We've split the cottages into areas. So select the area you wish to holiday, and you'll see all the cottages available from Cottages 4 You. Hoseasons also have a variety of holiday cottages around the UK (and holiday parks too). You can see the holiday cottages they have to offer you. Dales Holiday Cottages are a smaller cottage company, which focus on holiday cottages in the north of England. 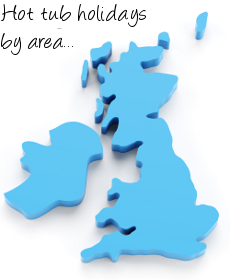 If you're looking for a cottage holiday in the north of England, choose your preferred area here. Cumbrian Cottages are another smaller cottage company which have holiday cottages in the north of England. If you're looking for a cottage break in Cumbria, have a look at the cottages available from Cumbrian Cottages. An independent cottage company, Sykes Cottages have around 2,200 cottage holiday around England, Scotland, Wales and Ireland. A family owned cottage company, with holiday cottages through Devon, Cornwall, Somerset and Dorset. Holiday cottages around England, with the majority of cottage being in Kent, Sussex, Hampshire and Somerset.